William Hogarth: “The Analysis of Beauty”, Plate 2 “The Country Dance” (1753). Traditionally said to represent a scene at Wanstead, though this is not universally accepted. 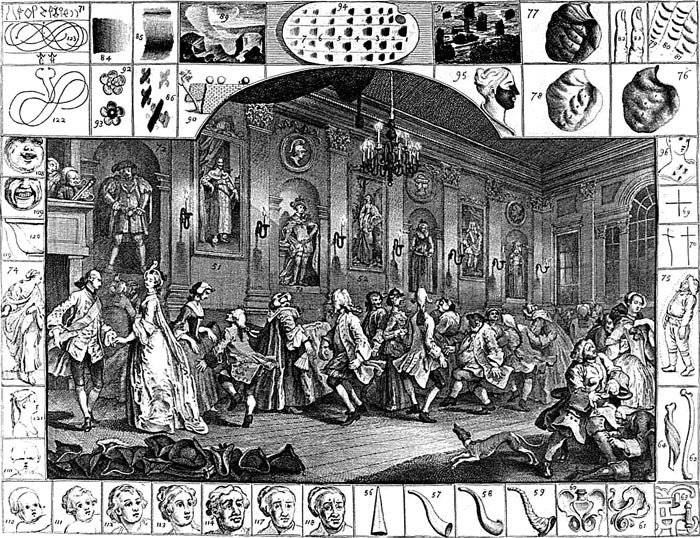 Adapted from a design as party of the "Happy Marriage" series, the engraver's complement to "Marriage à la Mode", this plate (which is traditionally said to represent a scene at Wanstead with the Earl of Tylney and his household) illustrates Hogarth's theory about the linear presentation of attitude and action.